First commuters on Borders railway Jump to media player The first commuters board the train from Edinburgh to Tweedbank as the Borders railway reopens after 46 years. New Borders railway line - in minutes Jump to media player Footage shows a journey along the new railway line between Edinburgh and the Scottish Borders in less than three minutes. Campaigner takes trip on Borders rail Jump to media player A rail campaigner who fought to save the Edinburgh to Borders railway line from closure in the 1960s takes her first trip on its replacement. Borders railway track completed Jump to media player The final piece of the Borders railway track is clipped into place. 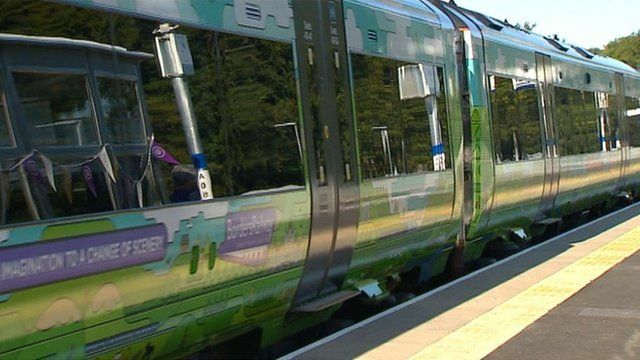 The first commuters have been using the newly reopened Borders Railway between Edinburgh and Tweedbank. The first train left Tweedbank near Melrose on Sunday morning where enthusiasts had been queuing for hours. The old Waverley line closed in 1969, and the new line is the longest domestic railway to be built in Britain for more than 100 years.